Hey all! I tried another great recipe as part of my April Challenge! This is recipe numero quatro of cinco. Not quite sure why I went all Spanish on you, but it just felt right. What do you do when you have a sleeping baby and extra apples on hand? Well, you make Apple Crisp, of course! I found this recipe on Pinterest and so I decided to give it a try. Boy, I'm glad I did! In my opinion, Apple Crisp is best served with a side of vanilla ice cream. However, we did not have any plain vanilla ice cream on hand. Guess what? I didn't even miss the ice cream; this Apple Crisp is just that good! Recipe from Tastes Better from Scratch. 2. In a medium size bowl combine the crumb topping ingredients with a fork or pastry blender until it resembles small crumbs. Refrigerate while you prepare the apple filling. 1. In a small bowl, combine melted butter and flour until well blended. Add lemon juice, milk, and vanilla. Stir well. Stir in brown sugar, cinnamon and salt. Pour butter mixture over apples and toss to coat. Pour apple mixture into a baking dish and spread into an even layer. Sprinkle crumb topping evenly over the apples .Bake for 30-35 minutes or until golden brown and top is set. Remove from oven and allow to cool for at least 10 minutes before serving. 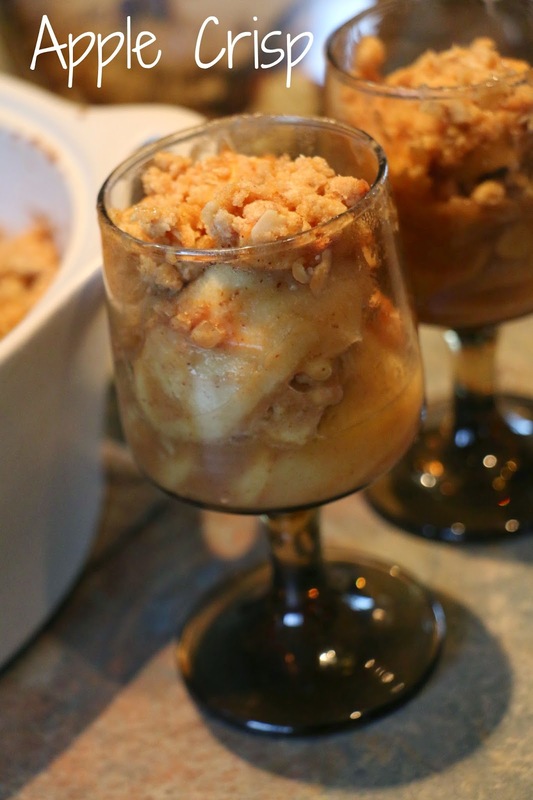 Readers, how do you like to eat your apple crisp? Do you enjoy a side of ice cream with it?